Singapore Cardfight! Vanguard Online: BT07 Rampage of the Beast King Preorders!! BT07 Rampage of the Beast King Preorders!! Our preorders for BT07 is now underway! Quick! Preorder with us as soon as possible as stocks are limited! This time, every box you get from us, you will receive an Alfred Early Promo card! So email us your orders now to avoid disappointments!! BT07, Boosting clans like Oracle Think Tank, Gold Paladins and the newly introduced clans in BT03, Dark Irregulars and Palemoon! Get them now! Release date is on 21st September. Two point of collection for you! Friday at Sengkang Mrt Station and Saturday at Douby Ghaut Mrt Station. 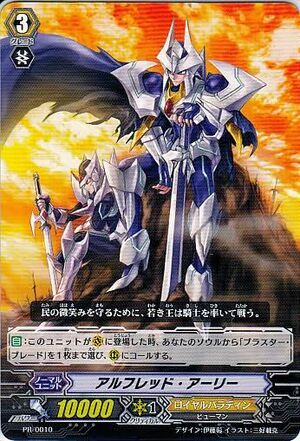 AUTO: When this unit is placed on Vanguard Circle, choose 1 "Blaster Blade" from your soul and call it to Rear-guard Circle.